There seems to be two publishers for this title. Chronicle Books are publishing it with the orange cover, and probably for distributing in USA. Thames & Hudson publishes it with a red cover and distributes it for Europe. So the price of the book will vary depending on where you buy it. Animation Sketchbooks follows in the same format as Comics Sketchbooks: The Private Worlds of Today's Most Creative Talents and Graphic: Inside the Sketchbooks of the World's Great Graphic Designers. 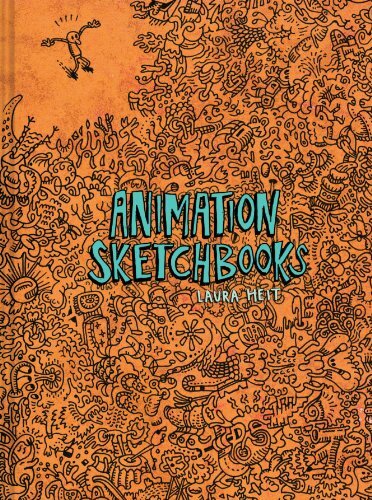 It features the sketchbooks of creative individuals, in this case, those who work for animation, not necessarily just artists. 50 creatives are featured and with 320 pages, it still means that the coverage for each person is quite limited. The text comes in the form of quotes plus a short profile on who they are, what they do and have created. There's not much text. The focus of the book is on showing the insides of their sketchbooks. The sketchbook pages come in the form of sketches, collages and doodles. A lot are random musings. It's difficult for me to understand the purpose of the book, probably as a pool of random sketchbook pages to dive into. The text doesn't talk much about animation and the sketchbook pages aren't necessarily linked to animation.